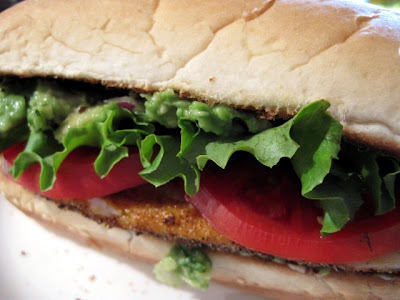 I love a good sandwich and this Cornmeal Crusted Tilapia Sandwich definitely fits into this category. Tilapia is a very mild tasting fish that is delicious used in lots of different styles of cooking. In this recipe, the fish is dredged in a spicy cornmeal mixture and cooked in a skillet with minimal oil. Topped with the last of my garden tomatoes, leaf lettuce and mashed avocado with onion and cilantro, this yummy sandwich is perfect for dinner on your busiest weeknights! Forget the drive-through at the fast food joints- make your own "fast food" at home! Serve this healthy, nutritious and delicious sandwich with oven roasted sweet potato fries, or with a steaming bowl of soup on a chilly evening. Try this tasty, easy sandwich on your next super busy day. Peel and seed the avocados. In a bowl, mash the avocado with a fork. Stir in the diced onion, lime juice and cilantro. Set aside. Heat a large skillet and 1 T. canola oil over medium heat. Mix the cornmeal and spices together in a container large enough to be able to lay the fish. Dry the fish with paper towels, then dredge the tilapia in the cornmeal mixture. Shake off excess. Lay fish in the hot skillet and cook about 3 minutes, and then turn over. Cook about 3 more minutes, or until fish flakes easily with a fork. Remove fish from skillet to a platter. Toast the sandwich rolls under the broiler if desired. Spread the avocado mixture over each roll half. On the bottom half, lay the fish fillet, then a couple of tomato slices and the leaf lettuce. Top with other half of roll. Open mouth and insert sandwich! Enjoy! I was inspired by a recipe in Cooking Light's 2009 cookbook, that is similar to this, but used lime butter instead of the avocado mix that I used. The fish was also broiled, instead of browned in a skillet. 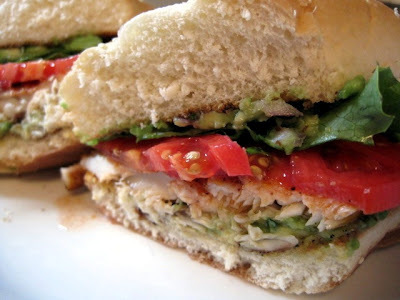 My husband and I both loved these tilapia sandwiches, so I'll be adding this to our rotation. A meal that is ready in less than 30 minutes- can't beat that! Have a great weekend! I really am going to have to try fish again. I'm so afraid of a strong fishy taste that I avoid all fish. I like that you said that tilapia is mild so I am encouraged. Your sandwich looks so very good that I want a huge bite of it! hmm. perhaps if my bread is thick enough and i use enough cilantro and cornmeal, i, too, might enjoy a fish sammich. it's worth a shot, at least, right? That looks darn good I have some Tilapia in my freezer! I live in Kansas (god's country)... Our sea fodd is not great, but we always have Talapia in our freezer. Always seems to be on sale. My hubs favorite fish is Talapia and I think he would love this. I like these fish sandwiches, must have tasted great with avocado. I will try this very soon. It looks remarkably good for a fish sandwich. You take such lovely pictures, it's always nice to "see" what you've been up to. Yes, yes, This is a great idea for a sandwich. Love it. I adore tilapia! This recipe is grand. I would imagine it would also be great with MN's favorite fish - walleye. Oh wow, where to begin! I love the look of your garden red tomato on this sammie. And the avocado mash is brilliant on this. The star, obviously, is that glorious fish. I love fish sandwiches, and haven't had one in forever. Mmm ... I'll take one of these please. Make it two so I can have one later as well!